Embark on an unforgettable voyage alongside Captain Nemo in his famous Nautilus submarine. You will be blown away not only by the graphics and sound, but by all the fantastic features this slot offers. Nemo’s Voyage Slots machine is an incredibly addictive new addition to the WMS collection of games, which delivers in every way. One more thing: this is one of the best paying slots online – 99% RTP. Major Vegas slots providers such as IGT, Bally, Aristocrat, tend to offer medium-low return in their online slots, Nemo’s Voyage and Monopoly Big Event slots are a nice exception. Not only does Nemo’s Voyage teleport you to the depths of the ocean with the unbelievable graphics and illustrations, it further draws you into the game with thrilling music and sound effects. Symbols include scary underwater creatures, treasure maps and harpoons, while the whole board gives the illusion of navigating the ocean in a submarine. Don’t be surprised if you forget about the world around you and lose count of time playing this game. However, beautiful visuals aren’t the only thing putting this video slot right at the top of our choices. It is the gameplay that makes Nemo’s Voyage so great. Although the number of paylines is fixed at 40, you can adjust the coin value according to one of 29 options. High or low stakes, it’s all up to you. The base game offers 7 different Wild and Bonus symbols that can seriously improve your chances at winning. But the game only gets more interesting as you continue to play it and descend deeper into the ocean. This is where it gets really exciting. What makes Nemo’s Voyage so addictive are the Wild Depths features. On the right side of the screen, you will be able to see a depth meter. With every new spin, the submarine descends deeper into the ocean and unlocks new bonuses. Multiplier Wilds, Pressurized Wilds, Clumped Wilds and Wild Reels are just some of the options you will be able to enjoy. 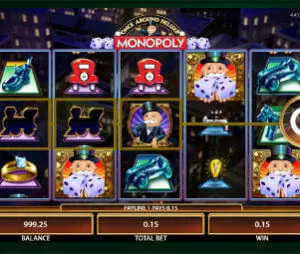 Getting the Bonus icon on reels I, III and V triggers 8 free spins. Giant Squid will appear randomly during the bonus to turn several symbols into Persisting Wilds. An alternate set for reels is used during Free Spins. Nemo’s Voyage slots is a true audiovisual experience that makes the most of its theme. 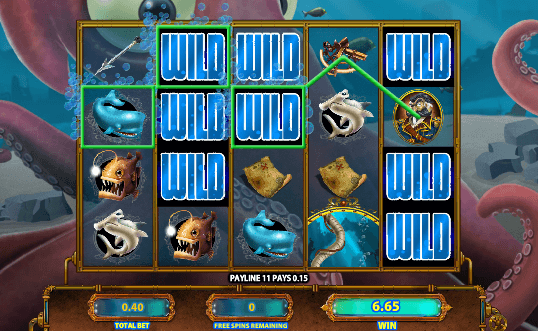 For the fans of online slot games, this underwater adventure will provide hours of fun. We promise you, once you hit that Spin button for the first time, you won’t be able to stop playing. WMS have clearly invested a lot of time and effort into creating an engaging storyline and some innovative features, and we have no doubts you will quickly learn to appreciate the final product.